Security is a large topic and one you could spend a lifetime mastering. The blueprint isn’t too helpful in clarifying what level of detail you’re expected to know for this as the ESX/ESXi configuration guides cover issues not in the ‘skills and abilities’ section. More in depth still is the vSphere Hardening Guide. I guess the main thing is to focus on practical issues as the VCAP-DCA is a practical exam – knowing that the VMkernel uses memory hardening is no use in an exam if it can’t be configured or tweaked! Some of this section seems to have been added for the sake of it – how often will an admin need to modify the SSL timeouts? I could only fine one KB article about it! Promiscuous mode – needed for packet sniffing, vShield Zones (and virtual ESX hosts). Disabled by default. MAC address changes –affects inbound traffic. May need to be enabled if you’re using MS load balancing in Unicast mode, or the iSCSI software initiator with certain storage arrays. Enabled by default. Forged transmits – affects outbound traffic. Enabled by default. Other network security measures (IPSec, VLANs, PVLANs etc) are dealt with in section 2, Networking. Edit /etc/ssh/sshd.conf and set ‘PermitRootLogin’ to YES (default is NO). See VMwareKB for a list of other settings you can adjust (including the available ciphers). You can use PKI to authenticate using SSH without being prompted for a password. This is a standard Linux procedure – for step by step instructions see VMwareKB1002866. By default only SSH server is enabled. Configuration -> Security Profile to enable SSHClient, or use ‘esxcfg-firewall –e SSHClient’. Use vicfg-user (this is only available via the RCLI (hence vMA) but not directly on the ESX/ESXi host. Removed the user testuser2 successfully. 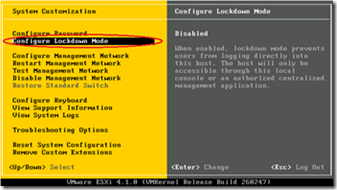 The longer the password the less complex it needs to be (see the ESXi Configuration Guide for full details). For calculating complexity the first character is ignored if it’s a capital, as is the last character if it’s a number. This is to prevent Password01 (for example) being a legitimate password!! 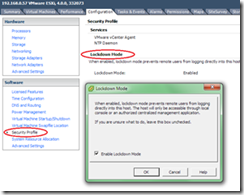 ESX uses Pluggable Authentication Mechanism (PAM) via the service console. 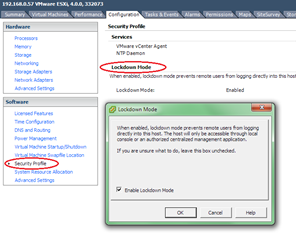 In a lab environment you can simplify the password policy – see VMwareKB1012033 or this article at vm-help. Further details can be found in this VMware community post (which covers v4.1) and David Davis has done a very useful video showing how to activate it. 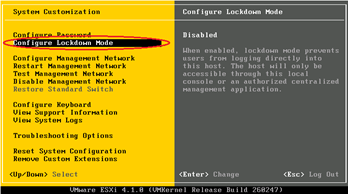 ESXi lockdown mode can be enabled via the DCUI, VI client,or via RCLI (using vimcmd). It is NOT possible to use host profiles. ‘vim-cmd’ is only available on the ESX/ESXi hosts (not the vMA). Once enabled you can’t use RCLI to disable it – you have to use the DCUI or VI client. v4.0 only removes permissions for the root user but leaves other users (and Tech Support Mode) unaffected. When enabled all configuration must be done via vCenter (which authenticates against the host using the special ‘vpxuser’ account). See VMwareKB1008077. 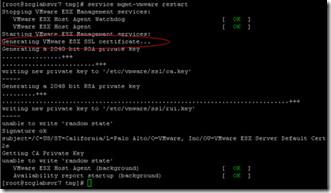 Certificates are used by vCenter to secure communications with the ESX hosts via SSL. Certificates are installed on both vCenter and each ESX/ESXi host. 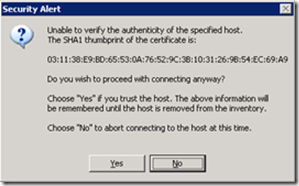 NOTE: Certificate checking is a prerequisite for FT.
Each host has a self-signed certificate generated during install. This is for localhost.localdomain however, so as soon as you rename the host it becomes invalid. 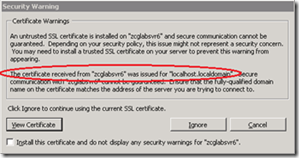 Generate certificates using a certificate authority (CA). This can be a commercial CA or an internal CA. Either way you’ll need the OpenSSL tools. See VMwareKB1023688 for full details. NOTE: You need to restart the management agents for this to take effect as you’ll need to re-add the host to vCenter. Add the CA certificate to the vCenter server’s local certificate store to establish trust between the vCenter server and the ESX hosts. 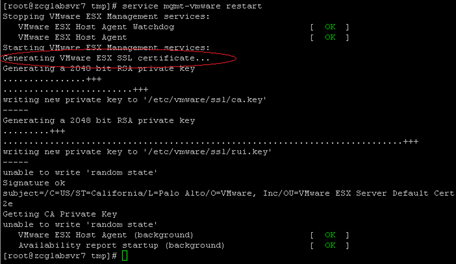 Add the CA certificate to a VI client’s local certificate store to establish trust between client sessions and vCenter. You may have to restart every host! (p5 of the VMware certificate white paper). In my tests you only had to restart the management agents however. 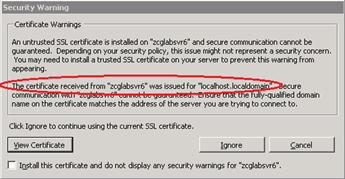 After generating a new vCenter certificate you have to rejoin all the hosts to vCenter (to refresh the SSL handshakes). Unless you have vMotion and a cluster this could be very disruptive. NOTE: Using vifs this way uses an HTTP GET which means the path to the config.xml file is based on the webserver’s root directory rather than the absolute path. It’s also case sensitive so remember – camelCase FTW! From the ESXi Configuration Guide – “To protect against misuse of ESXi services, most internal ESXi services are accessible only through port 443, the port used for HTTPS transmission. 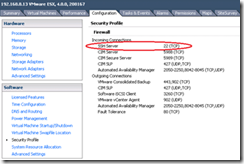 Port 443 acts as a reverse proxy for ESXi”. 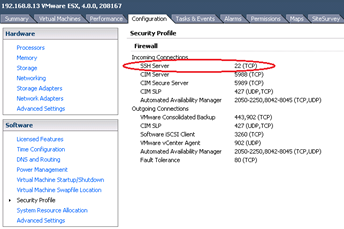 Where security is an issue you may want to disable some of the services offered by the built-in ESX/ESXi webserver (such as the default webpage). This can be done by editing /etc/vmware/hostd/proxy.xml. As with certificates, either use tech support mode or vifs to retrieve/put the file to ESXi hosts and remember to restart the management agents after any changes. Analyse logs – see troubleshooting section 6!